Although degenerative disc disease can be considered part of the normal aging process, some patients present with low back pain secondary to the aging of their discs. 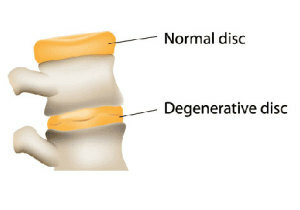 Discs are the shock absorbers in the spine between the vertebrae. With aging, the disc proteins change, and the disc becomes more brittle and dehydrated. This may lead to the subsequent development of osteoarthritis in the facet joints in the back of the spine. Patients presenting with symptoms may develop back pain, radiating leg pain secondary to nerve compression, neck pain or radiating arm pain secondary to nerve compression. As the disc wears out, the spine may become more stiff and painful. There are nerve endings in portions of the disc that may stimulate pain receptors in many patients. Typically a patient with degenerative disc disease will present with chronic low back pain. A routine physical examination including muscle strength testing in a neurologic examination will be combined with radiographic testing to evaluate degenerative disc disease. X-rays are commonly used which show a decreased height in the space between the vertebrae where the disc is. Bone spurs, called osteophytes, may also be present. In some cases, patients who fail to improve with time or conservative treatment, an MRI or CT scan is used to evaluate the spine more thoroughly. For the vast majority of patients who present with low back pain or radiating nerve pain emanating from the neck or low back, nonoperative treatment is successful. Such modalities as chiropractic care, physical therapy, anti-inflammatory medication, and occasionally epidural steroid injections are often used. Surgery is rarely considered for degenerative disc disease except for the most refractory of cases.